Many times when I begin the podcasts there are some great conversations that don’t make it to the final cut. One of these conversations was about Rhode Island and what Stacia really wanted to do when she graduated high school. Wine making wasn’t even in her vocabulary. So I begin these show notes with a little background on Stacia Williams that we spoke in detail about after podcast. Stacia grew up in Rhode Island and wanted to go to college at Johnson & Wales and major in Hotel & Restaurant Management. Her family talked her out of it, they said they are all engineers and scientist she should follow in those steps so she went into computer science. 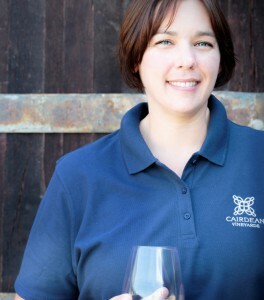 Once in the real world she entered into the software industry where she found herself drinking lots of wine, attending wine tastings, then she wanted to make wine. Stacia and Edwin met at a party where she took him down to taste her the wine that she was making in her basement and the rest is history! They moved to Fresno, CA so Stacia could study enology and viticulture at Fresno State and worked in the vineyard and winery on campus. After she was finished with her studies they looked all over the world for their place to settled and decided on Napa. Why? Because out of all the places they looked, they realized the wines that are made in Napa are the wines they like to drink the most. They found a 50 acre parcel in St. Helena. Their goal was to have a small winery with a small vineyard out front and make enough wine to support the vineyard and house. That would take a while since it takes 3 years after you plant vines to harvest your first crop to crush. They began to look at other vineyards and they purchased a vineyard in the Coombsville AVA, just east of Napa and began farming on it right away. This vineyard, Acquaintance is home to mostly Cabernet Sauvignon but all 5 Bordeaux reds are planted there. The following year they looked at a vineyard in Sonoma County which was planted with Pinot Noir and Syrah. The cool weather Syrah is dark and rich, not jammy, very expressive of Syrah character and the Pinot Noir is very cherry and bright fruit. Sold. They purchased this vineyard and began farming it as well. This vineyard they named Confidant Vineyard. Confidant, because of the rolling hills in this vineyard and the size, let’s just say what happens in the vineyard stays in the vineyard because nobody will ever know what happens in the vineyard except the vines. Their Atlas Peak Syrah was just rated 98 points, best in class and region and best in California at the California State Fair wine competition. This is mountain fruit from Atlas Peak aged in 70% new oak, half French half American for 3 years. Soon to be released and you will get a preview of the tasting notes in the podcast. They also have an on premise restaurant that opened June 5, 2014 “The Farmer & The Fox” and it’s been very well received. Executive Chef Joseph Humphrey has a wealth of knowledge and great creativity. It does have a Scotch flare with gastro pub menu featuring items such as burgers, smoked mussel chowder and popovers. Unique and special items such as Lamb Tartar, Rabbit Wellington and Game Pie (soft pastry dough, mustard cream pie, wild boar, duck and venison). A great feature is no corkage fee at the restaurant. Cairdean Estates is located on Highway 29 in St Helena, drive through downtown St Helena and they are 1.5 miles outside of town on the left. Visit them on line at http://www.cairdeanestate.com/ and on Facebook, Twitter and Instagram. The tasting room is open until 8pm. 2012 Haley Margaret – This wine is named after Stacia’s cousin who passed away from cystic fibrosis 2012 at the age of 25. This wine is a tribute to Haley Margaret to keep her memory alive and to raise awareness of the disease. They pledge $10 sold of this wine to the Cystic Fibrosis Foundation. This is a blend of Roussanne, Pinot Gris and Viogner. A wonderful wine and supports a great cause. Expressions of lemon curd, grapefruit and some stone fruit. Very light with balanced acidity is smooth and delicious. Great with food or a stand alone wine. 2011 Cairdead Vineyards Unoaked Chardonnay Napa Valley – Aromas of green apple, ripe pear and hints of citus lead the way to a soft palate with nice acidity.